Did you know that as late as 1944 American leadership was still concerned that the Germans might have an atomic bomb? Word that Adolf Hitler had gained possession of the Norwegian heavy water facility in 1940 greatly troubled American war leadership, who by then had begun exploring the feasibility of an atomic bomb at the urging of Albert Einstein. When America entered the war, and the Manhattan Project (named for the Manhattan District of the U.S. Corps of Engineers) was approved. One small facet of that project was to determine if the Germans had their own atomic bomb program, and if so, how far along was it? The United States and her allies soon learned that Werner Heisenberg was in charge of the German bomb program. (“Breaking Bad” fans will recognize Walter White’s bad-guy pseudonym). As late as 1944, after the invasion of France, the U.S. had agents seeking Heisenberg to assassinate him. By then they learned that there was no “German bomb” program, and that virtually all the equipment had fallen out of use for years due to Hitler’s budget needs. 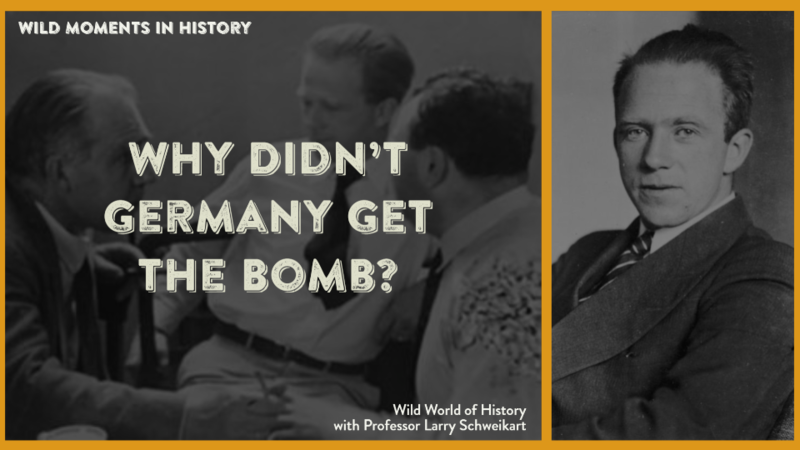 More recently, some scholars have questioned whether Heisenberg in fact stalled, delayed, and misdirected the German bomb effort into non-productive avenues. At any rate, by mid-1942, the German army gave up its control over the nuclear weapons program at which time it had only about 70 scientists working on nuclear fission. Heisenberg told German production supremo Albert Speer that even with all the resources he requested, it would be 1945 before a bomb would be ready. By then, the war would be over. In contrast, the Manhattan Project at its peak had 130,000 people working on the atomic bomb in some way. For further reading, see Thomas Powers, Heisenberg’s War: the Secret History of the German Bomb.